Your car’s battery is one of the most important parts in your vehicle that you shouldn’t neglect. When it’s working well, you may not notice its significance. However, you will only realize its importance when you try to start your vehicle, and it doesn’t turn over. If your battery stops working, there is no way you can restart your vehicle, and this seems to happen at the worst possible time. It’s difficult for batteries to drain, but it happens overtime. 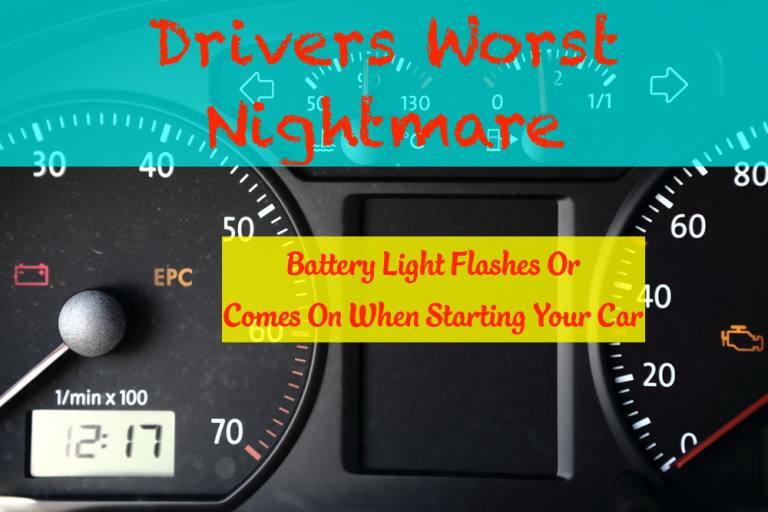 This is why many people are afraid when the battery light flashes when starting car. We will help you address similar battery concerns without being too technical, as here are some common concerns people run into with their car battery. Why Does the Battery Light Flash? It’s common to see the battery light comes on when starting car. Usually, this disappears after you start your vehicle, and this means there is no problem with your battery. However, there seems to be a problem if your battery light comes on when starting the car, and the light is still on after the vehicle has started. This is a clear indication that your battery is not recharging. How to Recharge a Car’s Battery? Recharging a car’s battery isn’t the same as recharging a battery for other devices you might own. Car batteries are automatically recharged when the engine is running. Inside the engine, the alternator is responsible for generating power. When the engine goes on, the alternator starts working. When you start your car, your battery will supply most of its power to crank the engine. Afterward, the power that’s consumed will be replenished when the alternator begins to recharge the battery. While the car is running, your battery stops consuming power because it’s the alternator that then supplies and distributes power to your car’s electrical system, which includes headlights, air-conditioning, and sound system. This is also the reason why the battery light you can see before you start your car disappears when the car is running. To recharge your car battery, all you need to do is to start the engine and wait until the battery light to disappear. Why Is the Battery Light Still on Even When the Car Is Already Running? Your car battery is primarily used to start the engine. Afterward, the alternator will do the rest. If your car battery consumes too much power to crank the engine, you may still see the battery light on for a moment as the alternator is recharging your battery, but that shouldn’t take that much time. If you notice the light is still on after quite some time despite the fact that the engine is already running, the most probably reason is that the alternator isn’t working properly. To solve this problem, check the alternator belt. Sometimes, a loose belt causes this problem, and if this is the case, then tighten it as this might fix the problem. Furthermore, check if there may be any cracks on the belt. Although a crack doesn’t cause these problems, this may cause the belt to break soon. If you notice some cracks, replace the alternator belt immediately. If the battery light is still on, check the battery terminals. There are times that the reason why a car battery is not recharging is because of corrosion. If you see some corrosion in your battery terminals, clean them with wire brush to remove the rust. Additionally, check the connections, whether or not they are loose, and tighten them and position the battery properly. Then, try to start the engine again and let it run for several minutes. If the light is still on, you need to replace either the battery or the alternator. Can I Still Drive Back Home Even When the Battery Light Is On? Your car can run even if your battery is already depleted as long as the alternator can still supply the power. However, if your car battery and the alternator are both not working, your car can still run, but you can no longer use every part of your electrical system. With this condition, the only thing you have to do is to keep the engine running. If it stops, you can no longer restart it since your battery is not any more able to supply power to crank the engine. This is possible, especially for older vehicles, which are not so much dependent on the electrical system. However, some new vehicles still need to consume electrical power to keep the engine running. If you notice the battery light is on when you start the engine even if it disappears after starting, it’s best to go to your nearest automotive shop to have your battery checked to avoid the risk of running down the battery while on the road. The next time you see your battery indicator is on, you know have some kind of idea what do about it. It’s difficult to be stuck out in the middle of nowhere due to battery problems, so it’s recommended you check your battery every so often to avoid future problems.